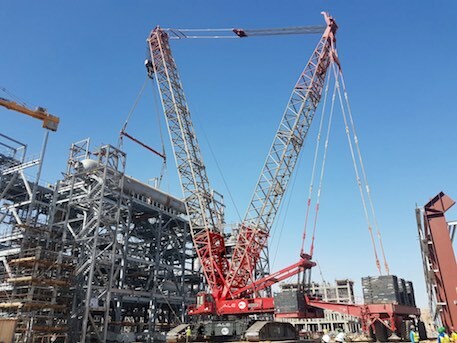 ALE has just completed the lifting of 11 heavy items inside a fertiliser plant in Aswan, Egypt. The British company transported the various components, including a 494 t ammonia converter and a 347 t pool reactor, using conventional trailers to the vicinity of the lifting area. Then the different items were lifted into position using 400t and 800t capacity cranes. The majority of the lifting was carried out by Liebherr LR 1400 used in tandem. The lifting system consisted of a 700 t beam with different sections which, with the choice of lifting mechanism, allowed ALE to adjust the length according to the characteristics and lifting points of each part.